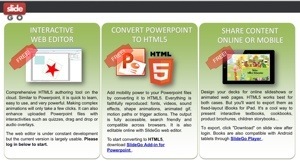 I have just discovered slidego, which is a web-based presentation maker. As you cannot make or edit a Google Presentation on the iPad, this is a handy alternative. Actually, it works really well. You can import from the camera roll, add animations and transitions and share via url. Quite impressive! Bump is a cool free iPhone app (which also therefore works on iPads) that allows you to gently bump devices together to instantly transfer photos, videos, files and contacts without the fuss of emailing. This is not an April Fool! Just as useful -and rather extraordinary -is that you can also use the app and any web browser to transfer the same kinds of items to and from any computer without the need for cables or iTunes. Could be very useful for enabling students to share work with one another and with the teacher…let’s say photos they have taken on a field trip, for example. I have struggled for some time to get the Aurasma creation and sharing process working, but now that I have- with some help from looking at Kelda Richards’ blog, and working in tandem with my colleague Nicky Hodges and Tweetbuddy Dee Blackman – I thought I would share a video tutorial that takes you and your students through the steps needed to bring those displays to life! 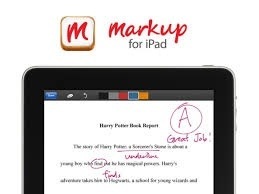 I have been trying the beta version of Markup, a Kickstarter project by the creators of Showme that has been fully funded and has now been submitted to the App store. Essentially, you set up an email address with Markup, your students email a pdf of their work to that address. You open the pdf, annotate using your finger or stylus, from a small palette of colours, then mail the pdf back to the student. It works perfectly as described…but even though I backed this app on Kickstarter, it is not -in its current form at least – the answer to iPad workflow, as I can already achieve the same goal, but with many more functions like voice recording, typed text etc with other apps like Explain Everything. The workspace is not searchable and there is no way to organise student work into folders so the interface will quickly become unmanageable. Also, whilst you are making annotations you can undo or erase them but if you close the document and reopen it, your earlier annotations are no longer editable. What I dream of is a seamless solution where student saves a pdf to a shared workspace, I open it and annotate over the work..but just as a layer on top…the student then opens the work and makes changes to their original. No email, no multiple versions. Currently the closest I can see is using the annotation feature in Edmodo, or students using Google Docs. Of course, Edmodo features GoogleDocs integration so I think that is worth further investigation. Hapara offers a great teacher dashboard solution for GoogleDocs, at a cost, but of course you cannot make or edit a Google Presentation on the iPad…hmmm. None of this is uniquely an iOS issue, the same would be true on an Android or Windows device in terms of the digital submission/correction/resubmission flow. Whoever comes up with the solution to this is going to make a mint! The key will be having a way to organise and view student work without needing multiple folders. Obviously, the Holy Grail would be having this system work with school information systems and feed into assessments, grades and even reporting..a one-stop shop.